Sheraton Sand Key Resort, in Clearwater Beach, Florida, has been awarded “Best in Class” in 37 categories for the annual Meeting Planner Satisfaction Index (MPSI). This is the second year in a row that the Sheraton Sand Key Resort has scored the highest of all Sheraton’s throughout North America, and for the fourth time in the five years the survey has been conducted. The MPSI scores are tabulated from a poll of meeting planners who rate their overall experience at Starwood brand hotels and resorts. This program allows Meeting Planners to voice their opinions on the individual properties, as well as the brand. Starwood’s brands include Sheraton, Westin, W, St. Regis, aloft, four points, Le Meridian and Luxury Collection. Meeting planners are surveyed via email on 49 different categories and the criterion is based on a scale of one – five, with five being the highest. The MPSI includes all Starwood hotels with a minimum of 10,000 square feet of meeting space, who host meetings, conferences and social events. The 2011 meeting planners ranked Sheraton Sand Key Resort in first place in nearly a third of the categories, including Overall Experience, Overall Value, Likelihood to Recommend, Overall Service from Sales, Front Desk Helpfulness and Partnering to Achieve a Successful Meeting. The resort remained in the top five for nearly all of the categories. 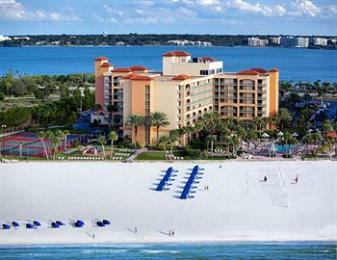 Sheraton Sand Key Resort is Tampa Bay’s premier meeting destination with incomparable meeting and convention services. The resort offers more than 24,000 square feet of indoor meeting space as well as 10 acres of exquisite private beach on the Gulf of Mexico. Grand Ballroom, accommodating up to 800 guests. Island Ballroom, accommodating up to 500 guests. Six conference or breakout rooms. 390 guest rooms and suites. Award-winning catering and conference coordination services. To learn more about the Sheraton Sand Key Resort, please visit their website at www.sheratonsandkey.com.